Propolis, a complex mixture of resinous and balsamic material collected by honeybees from plant material and mixed with bees’ salivary secretions, is composed by different groups of compounds that have been linked with diverse bioactivities. In particular, flavonoids, phenolic acids and their esters were associated to valuable biological properties such as antioxidant and free radical scavenging1,2. Propolis possess substantial variability of chemical composition and bioactive profiles, even from the same origin but collected in different years3. However, Portuguese propolis samples from an apiary named Gerês (G), normally obtained by mixing propolis from three places - Bugalho (b), Toutelo (t) and Felgueiras (f) - show similar chemical and biological profiles over the years (Freitas, under reviewing). Recently, a new propolis place - Roca (r) - was added to the apiary. In this work we have studied three Gerês propolis samples collected in 2017 (G17), but composed by different combinations of source places: G17-r; G17-rt and G17-tf. Total phenolic, total flavonoid and ortho-diphenol contents were determined for the ethanolic extracts (EE) obtained from the three propolis samples and DPPH• scavenging assay was performed to evaluate the in vitro antioxidant capacity of G17.EEs. All propolis samples showed antioxidant capacity, having one of the extracts, namely G17-r.EE, the highest scavenging ability of DPPH•. This extract was also the one with higher content in phenolic, flavonoid and ortho-diphenol compounds. Note: Ana Freitas and Ana Gomes contributed equally to this work. Acknowledgments: Financial support provided by FCT (PD/BD/128276/2017), under the Doctoral Programme Agrichains - PD/00122/2012. 1. Silva-Carvalho, R., Baltazar, F., Almeida-Aguiar, C. 2015. Evidence-Based Complementary and Alternative Medicine 2015. 2. Cruz, M., Antunes, P., Paulo, L., Ferreira, A. M., Cunha, A., Almeida-Aguiar, C., Oliveira, R. 2016. RSC Advances 6(55), 49806-49816. 3. Veloz, J. J., Saavedra, N., Lillo, A., Alvear, M., Barrientos, L., Salazar, L. A. 2015. BioMed Research International 2015. ISNAD FREITAS, Ana Sofia P. , GOMES, Ana João P. , CUNHA, Ana , OLIVEIRA, Rui P. S. , ALMEIDA-AGUIAR, Cristina . "Differences in Chemical Composition and Antioxidant Activity of Three Propolis Samples Collected in the Same Apiary". 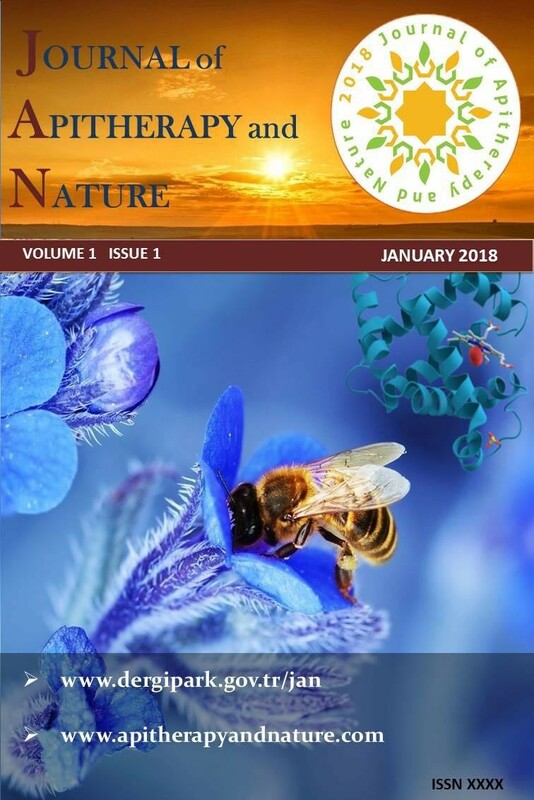 Journal of Apitherapy and Nature 1 / 3 (December 2018): 44-44.